More sightseeing in Boston. 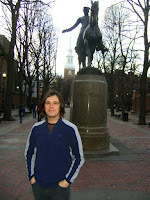 Here is Michael at the Paul Revere monument in front of the Old North Church, where lanterns were hung in the steeple to warn of the British coming. There is so much history in this area. 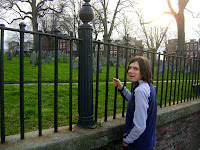 Copp's Hill Burying Ground (Boston's 2nd oldest) was locked, and we sadly could not go in. At night, we decided me must eat some seafood before we leave Boston. 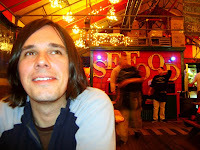 So we went to a restaurant called the Barking Crab. It was on the water by Boston Harbor and had a really fun atmosphere. Michael doesn't like seafood, but I got a bucket of crab claws and forced him to try them. 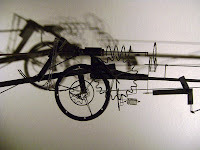 We went to Cambridge to the MIT Museum on a free day. 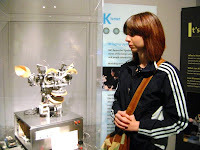 Here I am with the robot Kismet! 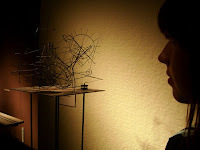 We also saw many delicate mobiles. Another early morning! 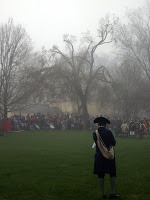 For Patriot's Day, we awoke around 4am and made our way to the Lexington Green, to commemorate the Battles of Lexington and Concord, the first battles of the Revolutionary War. 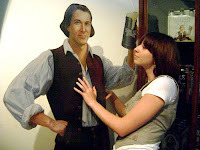 There, I saw my first reenactment. With a rebel yell! 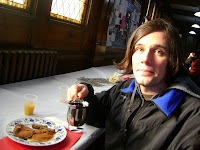 Afterwards, the nearby churches had pancake breakfasts. We found one that served sausage. Mmm. Our last day in Boston! 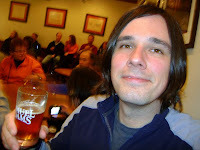 We found out about a free tour of the Samuel Adams Brewery, so of course we had to go. The tour was a lot of fun. 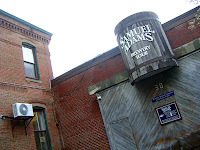 After showing us the process of beermaking, we got unlimited samples of different Samuel Adams brews! 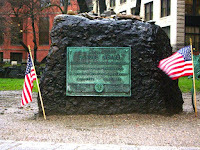 Afterwards, we felt the urge to go find Sam Adams grave at Granary Burying Ground (Boston's 3rd oldest). And here it is below. 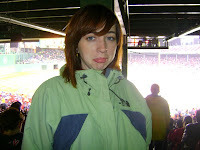 That evening, after finding cheap tickets online, we went to Fenway Park to see the Red Sox play the Twins, crossing our fingers that the rain would not cancel the game. Such a cool baseball park. I don't think there are many other stadiums in a city's downtown. 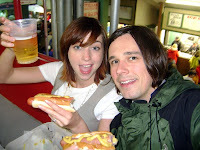 Here we are enjoying hotdogs and waiting for the rain to subside. 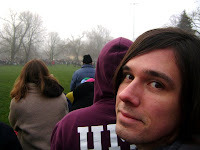 Here I am after the rain has not subsided, and the announcer just called the game off. Not to worry, though. The next day as we were leaving Boston, we found out the game had been rescheduled and we managed to swing by and watch a few innings! Sam is my fave. Jealous.